Warning! horrible co-worker ahead! Every work place has one. That absolutely impossible, difficult, nasty, backbiting individual who makes it his/her personal mission in life to belittle everyone else and make their life a living hell. Usually, people like this are also extremely manipulative and good at managing both HR and their own boss. When you’re forced to work with or for one of these human porcupines, here are some strategies that will help you escape the worst of the pokes. To begin, you need to understand how this person got to this place in the first place. It’s a little bit nature and a little bit nurture. Every once in awhile this personality type is just plain mean through and through. However, usually nasty behavior stems from a deep personal insecurity about themselves or their ability to perform their job. Maybe they feel they aren’t good enough; maybe they never got an “A” in school; maybe their mom beat them as a child (seriously). For whatever reason, they feel inferior and by making you miserable they are bringing you down, too. They get perverse satisfaction by doing this. It’s a vandal’s mentality. Smashing nice things that belong to others is fun. If they are truly horrible they also chase much of the competition for their job and vertical promotions away. This only makes them even more horrible because they now see concrete rewards for their bad behavior. Before you know it, all office etiquette is thrown out the window and there is an office monster on the loose. The number one best strategy for dealing with a horrible co-worker is to kill them with kindness. For every exasperated sigh, provide a smile. For every accusatory rant and rave, provide a calm understanding response. Always stand your ground but don’t react to their nastiness. After the first or second time you throw kindness in their face, the bad behavior should stop. Best of all, you will get a euphoric feeling inside, “AHA, I’ve controlled the beast.” This will make it easier and easier to keep your calm when confronted with accusations, back stabbing campaigns and ghastly behavior. Best yet, if they keep it up you will make them look like an utter fool. This doesn’t mean transfer departments, it means being aware of a negative environment and removing yourself from it. You wouldn’t work outside in a snowstorm unless you had to. Why work next to a human tornado? If you have a flexible working environment, it will be easier for you to focus on your job if you aren’t constantly upset and trying to manage the work bully. There is a lot to say for out of sight, out of mind. Even noise reduction headphones (turned on or off) can do wonders. Make it clear to your boss that you can be found at all times in your new alternate location. Don’t ever give up your territory – just be somewhere else a lot of the time. Whenever emotions take over the brain it is almost impossible to think logically and make good decisions. 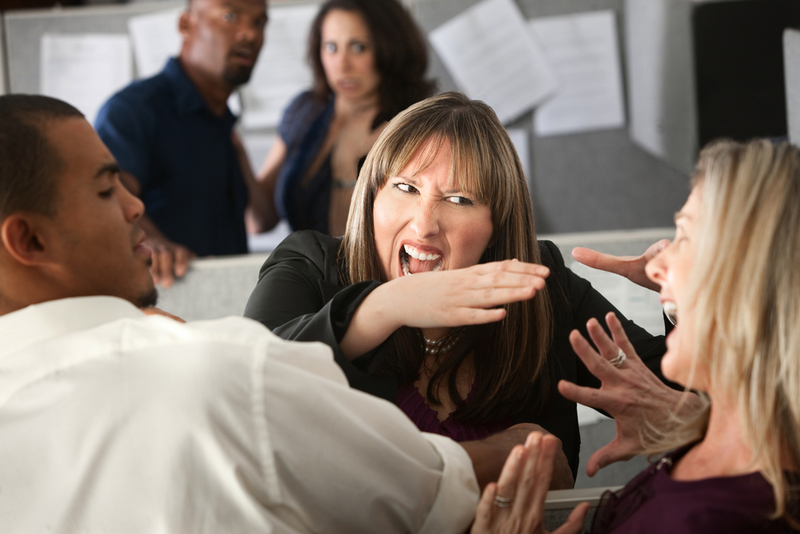 Realize you need to manage your own responses as much as managing the work bully. An easy way to do this is to lay future fantasy plans about ways to get even with the work bully. With every snide remark you can add another imagined revenge. In all likelihood, you will never actually follow through on any of your plans, but if you bide your time there may come a point when you can inflict massive and substantial damage to the work bully and seriously undermine their career. Revenge like this is unbelievably sweet. This sounds evil, but think of all the poor future souls you will be protecting. Often the work bully will respond favorably to your kindness and afterwards try to befriend you. No matter how tempting this is (you might actually really come to like them), never trust the Tiger. This is a professional relationship, let it become more and don’t be surprised if you get bitten. The camaraderie may be nice and the nasty battle-ax deserves it, but this type of behavior is unprofessional and against all normal office etiquette. In addition, bullies are uncommonly good at staving off attacks. Fighting is what they do best. Don’t assume you and your comrades will end up winning the war. Don’t let a nasty co-worker bring you down. Follow these tips and be the better office mate! RELATED-->>Get a copy of Living Rich by Mark Ford HERE!